Ultradex have a range of high quality oral hygiene products to give leave your mouth feeling confidently fresh and odour free for the day ahead. With everything from toothpastes to mouthwash, dental tape to fresh breath spray, I’ve been trying out a selection of their products to see what I thought. I found the mint fragrance of the products to be quite mild but pleasant to use and still leave your mouth feeling really clean and fresh. The Daily Oral Rinse mouthwash actually comes unfragranced with a sachet of Peppermint flavour which you can add and shake up into the bottle should you wish to make it a minty fragrance. This mouthwash also promises to eliminate bad breath, restore natural whiteness and protect teeth and gums. The Recalifying and Whitening rinse has all the above features but with SensiShield Advanced Technology which recalcifies tooth surfaces to leave them smoother, brighter and less likely to stain. The toothpastes come in Low Abrasion and Recalcifying & Whitening versions, both of which are pleasant to use and leave your mouth feeling clean and cared for. Other products from Ultradex include Anti bacterial Interdental Tape which comes in a really handy little dispenser (easier to use than other brands) and works well. I regularly use dental floss and find brands do vary and have to try various ones that work for me. This did a good job and fitted well between my teeth. There are also Interdental Brushes available and a Fresh Breath Spray which is ideal for carrying in your handbag to use are a garlicy meal out! 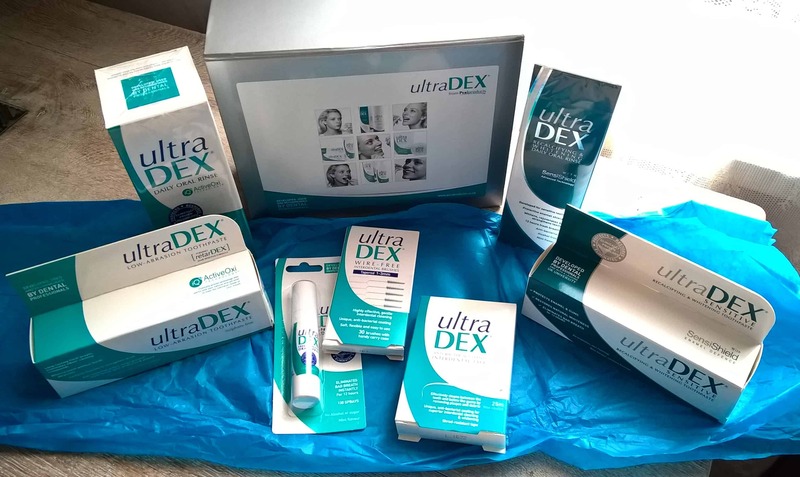 Overall a great range of Ultradex products that seem to do a good job and that I would continue using to maintain good oral hygiene!